Some patterns afford a certain degree of free expression. Wurr has recently developed tabletops and trays using her patterning techniques. In this pattern the general structure is very precise. Looking at a corner of Wurr's shop in mirrored window panels. 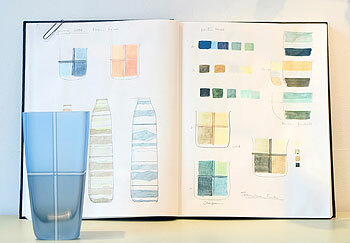 In Penelope Wurr's studio, creation of a new series of glass vases always begins with her sketchbook, where design elements and color combinations are determined. Penelope Wurr: Fine Contemporary Glass, at 167 Main Street in Brattleboro, is an unassuming treasure trove and, at first glance, easy to pass by, as I have done many times during my rush around town. 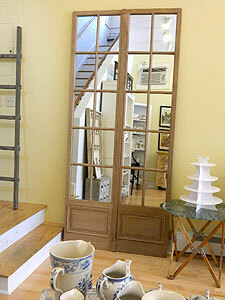 I had a chance to explore this new addition to downtown and connect with its artist-owner, who has been featured in a number of esteemed publications including Elle Décor and The Boston Globe Magazine. While visiting Penelope's shop for the first time, I noticed many unusual items in addition to a few of her monoprints on display and a wide assortment of her beautiful patterned glasswork. One can find everything from a greeting card with Gustav Klimt's "The Kiss" to reproductions of quaint vintage handbooks whose topics range from the art of kissing to how to keep your lover, or a mix of other items unique to Penelope's quirky, fun-loving, native-British taste. 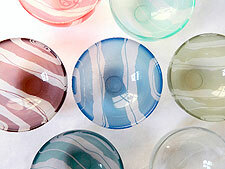 Beyond these offerings, there is a much bigger story about the artist, her glasswork, and her motivational influences. One could say that Penelope has always had artistry in her veins, with siblings who are both graphic designers and parents who were architects. Originally completing her degree studies in Graphic Design and Illustration, Penelope's professional work was in the area of illustration and storyboard creation within the film, publishing, and advertising industries. (She is also the author of three children's books.) 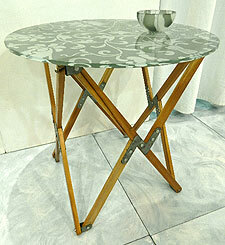 However, her fascination with patterns and the images she uses in her glasswork was birthed during her childhood. She explained, "I believe that my glasswork images are tied in closely to what drove me as a kid, way before I became a printmaker. As a young child of architect parents, I was very absorbed with patterns and the sequencing of them. I helped my mother with her architectural plans; drawing in the bricks on her dyeline prints was an after-school treat, or placing circular tree symbols on the landscape." Designs, patterns, color, and creating were inextricably connected to Penelope's world also through the influence of her grandmother, who taught Ikebana, the art of Japanese flower arranging. While other young children might have been left at a babysitter's house or daycare, five-year-old Penelope was dropped off at her grandmother's Ikebana classes, where her sense of special arrangement and use of color was nourished. This multifaceted and diversely disciplined artist used her skills and abilities as an illustrator and printmaker to inspire many of her glasswork themes and patterns. Penelope further explained, "I have one vase -- Oval Patch Cameo -- loosely based on The Tailor of Gloucester by author Beatrix Potter. Sometimes I find it easier to design if I am given a theme to work with or at least something that connects all my designs, be it a color theme or a common design feature." She has held several patents related to her process for producing the patterns on her glassware, which involves a combination of finely controlled sandblasting and enamel overlays. One of the most important questions I wanted to ask Penelope was why Vermont? What drew her to this area? What I didn't know is that her craft and some of her store offerings have been a fixture in Putney Village for the past several years. "It was a natural progression to settle here," Penelope shared as she further explained that she and her husband used to bring the kids every weekend as a welcome retreat from their Manhattan dwelling. The kismet combination of Putney resembling an English landscape, a local Vermont journalist reaching out to secure an interview, and the vibrant community of artists living here ultimately enticed Penelope and her family to stay for good. As I like to do with all artists or anyone pursuing their passion, I asked Penelope to share some words of wisdom for someone looking to explore art or jump into their own particular passion. She left me with this message: "Have a sketchbook or something where you write things down -- it's a way of reminding you of what interests you at the time. It also allows you to take note of the things you find artistically stimulating. It is like that Thomas Edison quote about creative genius being 1% inspiration and 99% perspiration. Having a good idea is one thing, but there is the hard work that goes with it ... and a sketchbook!" This year Penelope took a sabbatical from creating her glasswork to move her shop from Putney to Brattleboro and expand its scope a bit. This is, however, only a temporary break; she hopes to get back into her printmaking and glass design in the not-too-distant future. Check out some of her unique pieces -- from vases and bowls to serving trays and tables -- and a few of her monoprints in the Main Street boutique or online at www.penelopewurr.com. Amidst a collage of offerings in her store, there are trinkets and humorous touches that will make you smile, other things that will remind you of a certain knowing or creativity, but overall a welcoming invitation expressed by Penelope Wurr's warm personal presence -- evident even in how she has "dressed" her shop -- and by her elegant art glass.